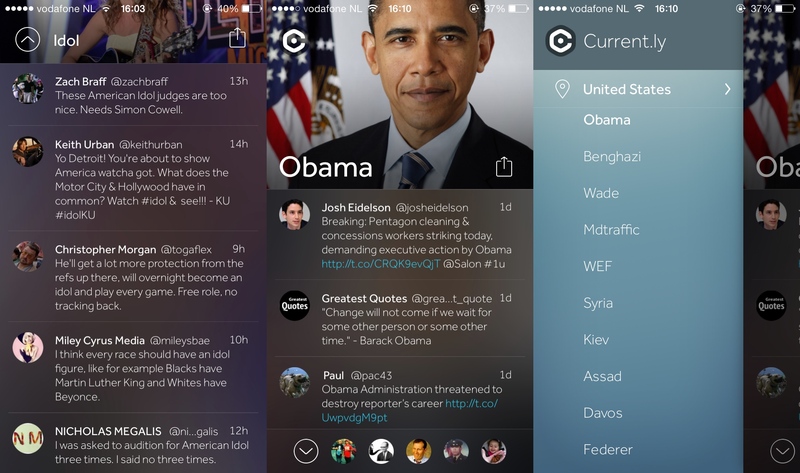 Meet Current.ly, the app that resurfaces interesting content on Twitter. It works a lot like Twitter’s own trending topics, but better. The startup tries to show more interesting content. It’s a visually compelling laid-back Twitter experience to keep track of the major events happening right now. When you open the app, you get a timeline for the most important topic right now (Mobile World Congress while writing this post). With a swipe, you switch to an entirely new timeline with its own dominant color. You can quickly skim through multiple topics without diving deep into one. Scrolling through the app feels a lot like scrolling through Frontback, Mindie or Flink. You are immersed in the app. There isn’t any overwhelming UI elements. A trending topic fills up the entire screen, and with one swipe you go from one topic to the other. If you want to know more about a particular topic, you can tap on the top banner and then you get a more traditional scrollable timeline filled with the most interesting tweets on this particular topic. It doesn’t depend on who you are following on Twitter. If you tap on a link, it opens the article or website. In some way, it feels like the Facebook Paper of Twitter. But Twitter is a better platform than Facebook for this — it’s a news network after all. Before this app, the Amsterdam-team developed PeerReach, a sort of PageRank for Twitter accounts. Naturally, the new app uses all this data and more to find the most relevant tweets on a particular subject. The algorithm takes into accounts retweets, retweets by influential people, replies and the content of a tweet. “When Bitcoin is a trending topic, we know which people is notorious on Bitcoin for instance,” Menkovic said. 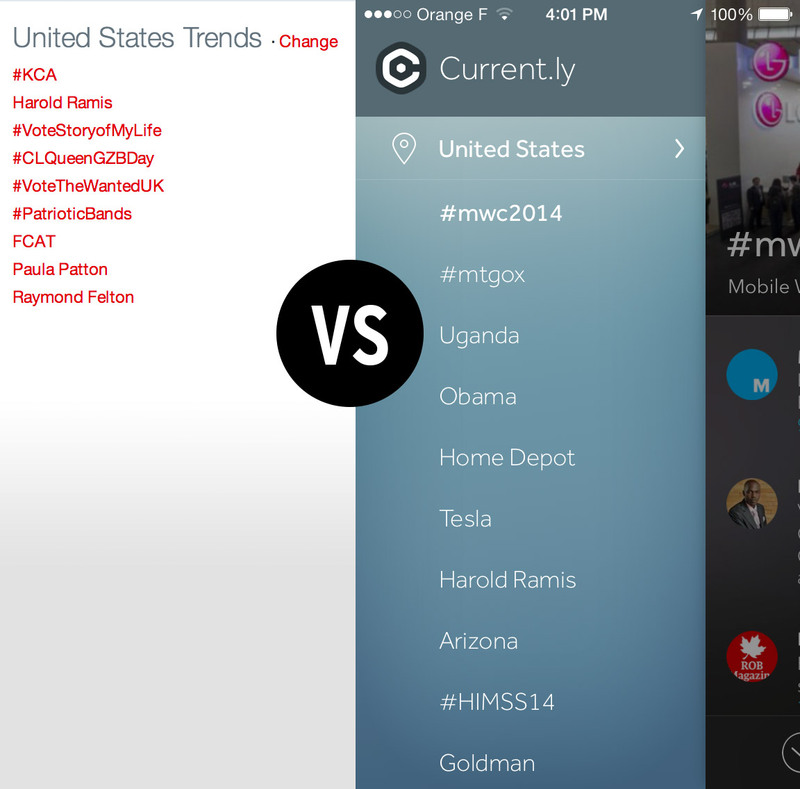 For now, you can select between trending topics in the U.S., the U.K. or the Netherlands. Other countries will come later this year. Menkovic, his co-founder Nico Schoonderwoerd and the rest of the team of seven started working on Current.ly during the summer of 2013. “We wanted to make Twitter more accessible for a broader audience,” Menkovic said. It has raised $310,000 in funding so far. When asked whether beta users come back often, he told me that 25 percent of them come back on a daily basis. “We will have push notifications for bigger events,” Menkovic said. Overall, Current.ly is what Twitter trending topics should have been, resurfacing interesting content from its hundreds of millions of users. Instead, a small startup had to develop a mobile app with a neat design. It is focused to one simple thing: allowing you to listen to the pulse of the world.